Chance the Rapper presents a $1 million check to the Chicago Public Schools Foundation on March 6, 2017. CHICAGO, IL -- Chance the Rapper announced Monday he is donating $1 million to the Chicago Public School Foundation after meeting with Illinois Gov. Bruce Rauner last week to discuss funding options. Earlier, Rauner's administration circulated a memo with options for funding Chicago Public Schools after meeting with the Grammy-winning artist on Friday. The memo outlines two options for the nation's third-largest school district to receive $215 million in pension relief Rauner vetoed last year. The cash-strapped district had factored the funding into its annual budget. Rauner says it should've been tied to larger pension reforms. 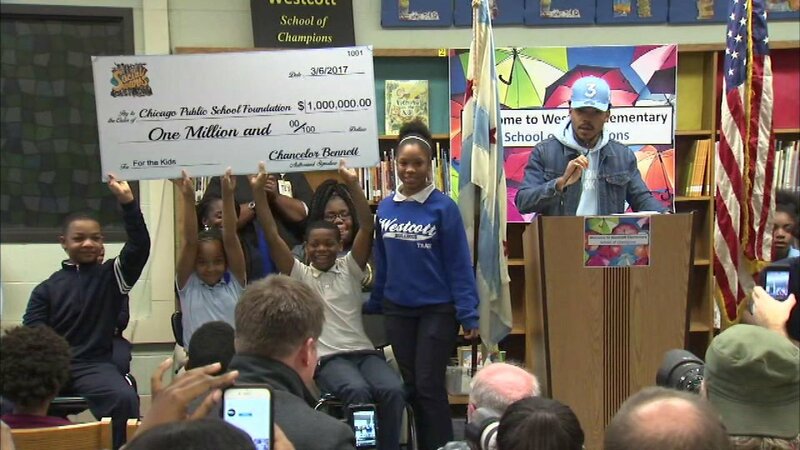 The Chicago-native rapper, whose name is Chancelor Bennett, planned a news conference Monday at a school. He posted a preview on Instagram Monday morning. Rauner and Chance met Friday to discuss CPS funding after the artist asked for a sit-down. He attended city schools. However, Chance says the meeting didn't go as planned and Rauner left him with "vague answers."